Like most fruit trees, before orange trees bear fruit, they must first produce blossoms from which the fruit will set. Orange blossoms are small, fragrant flowers that can cover a whole tree and perfume the air. 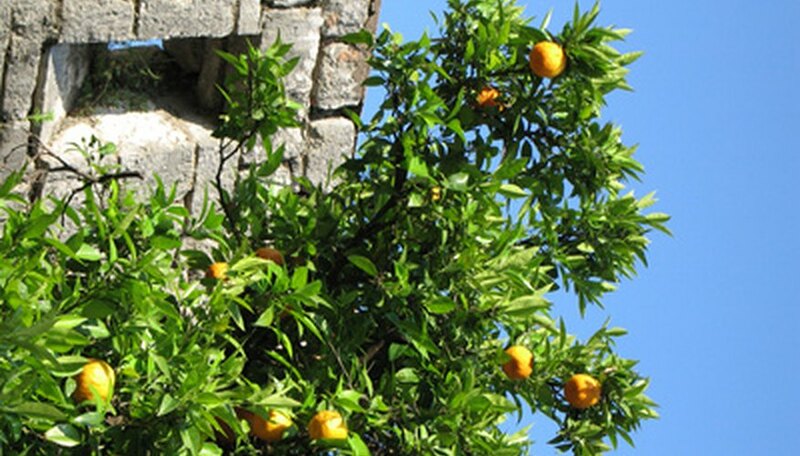 Orange blossoms, which go through three stages before dropping from the tree, are the state flower of Florida. Most blooms do not evolve into fruit, as they fall from the tree. When orange blossoms first appear on a tree, they are small, round white buds about the size of a pea. The buds form in small groups on individual offshoots of the main branches. The buds begin to form in late winter or early spring, depending on the climate. As the buds mature, they become elongated as the petals develop. Buds open into small, white or pink, waxy-feeling blossoms that have five petals that form a cup around a large group of orange- or yellow-tipped stamens. The flowers are about 1 inch in diameter and appear in small clusters. Though most flowers will not ultimately produce fruit, all are fragrant. As orange blossoms age and/or become pollinated, they begin to lose their petals, which usually drop one at a time. As the petals drop, a pollinated flower will give way to a tiny, green fruit that may take six months or longer to mature into a usable orange.